"The 9/11 Mystery Plane & the Vanishing of America"
The following book review will actually be more of an expose since I have had personal dialog with the author, Mark Gaffney, before and after the release, and therefore have special insight into his mindset in the final months before it went to print as a whirlwind of new evidence was unearthed. Gaffney doesn't explain until later in the book how the "cover-up" that he is asserting this data "proves" is concerning his own assertion that any trace of the "mystery plane" was deliberately altered out of the 84 RADES data. Obviously if this was the case the notion that it "slipped out" on accident from some random "honest" military worker is simply ludicrous. There would be no purpose to deliberately manipulate evidence that they never planned to release. The fact that this simple logic escaped Mark Gaffney is mind-boggling. But as it turned out, after the book hit the shelves, he pretty much immediately started floating the notion that the mystery of the "mystery plane" had been "solved". So Mark has abandoned the notion that the photographed and video-taped E4B was in the air over DC before the attack proving foreknowledge, which was the main premise of the book, but this also forces him to abandon his very strong assertions in the book that the 84 RADES data had been manipulated to remove the alleged flight path of this craft. So he has, in essence, admitted that both of his most relevant conclusions regarding the E4B proving a deception on 9/11 were completely faulty. Although this would seem to be an unfortunate situation for an honest researcher who simply found out he was wrong and admitted it, this review will reveal how even the evidence he presents in the book clearly demonstrates the E4B was in the air after the attack and that Mark Gaffney had no legitimate reason to not understand this as he wrote it. March 8th, 2008 Citizen Investigation Team (CIT) received an email from Mark Gaffney requesting a complimentary copy of our DVD "The PentaCon Smoking Gun Version" (that proves beyond a reasonable doubt with evidence that the Pentagon attack jet flew on the north side of the former CITGO gas station and therefore could not have hit the building) as a research tool for his upcoming book to be released in September. I agreed and also highly recommended that he review our latest full-length presentation we had just released 2 weeks prior, The Pentagon Flyover - How They Pulled It Off. I informed Mark how in this new presentation, we discuss the E4B but also present a large body of evidence (including the at the time brand new independent witness account from Steve Chaconas on the Potomac River) demonstrating how the Pentagon attack jet, that was believed to have hit the building, actually flew over DC skies and came from east of the Potomac River. This simple fact is fatal to the 2006 released alleged black box data from the National Transportation Safety Board (NTSB) that has the plane west of the river at all times. So he agreed that there was a north side flyover timed with the explosion as reported by the CITGO witnesses but came to the ridiculous conclusion that the plane did another loop as seen by Steve Chaconas and came back around to hit the light poles and the building as reported. What this would mean of course is that the plane would have hit the light poles and building while everyone in the area, including first responders and no doubt people with cameras, was already staring at the building in shock watching it burn from the first explosion. So he was describing 2 completely separate violent events both involving large low flying jets even though not a single person reported such a thing. Naturally if this had happened the "2nd pass" impact would have been on live TV much like the 2nd attack on the WTC. Certainly, in the very least, numerous eyewitnesses would have reported this yet of course none did. At this point I had no choice but to question the rationality of this individual and I started to understand why his tone with me seemed tense and a bit awkward. I explained to him as detailed and polite as I could how this assertion is completely unsupported, and therefore quite impossible given the circumstances, but Mark gave no indication that he was merely brainstorming or throwing out ideas in friendly discussion. His confrontational and dismissive tone led me to believe he was being dead serious. My entire impression of Mark Gaffney changed and I was unable to think of him as a serious or honest researcher. He had demonstrated a complete inability to think critically and it was clear he was reaching for anything to downplay the significance of the north side approach evidence we had uncovered while searching for ways to tie it all in to the E4B. His double loop/double violent event theory would never make it to his book but it was merely replaced with something equally as ridiculous, ironically also involving a flyover. More to come on that. Mark went on to describe to me in March 2008 how he already believed that the 84 RADES data has been tampered with, "You are also correct that something is amiss with the RADES data. The RADES data does not tally well with our eyewitness accounts of the E-4B flight path. Also the timeline remains an issue. Peter Jennings reported the white plane over the WH at 9:41 am which as you correctly state was before the launch at Andrews. 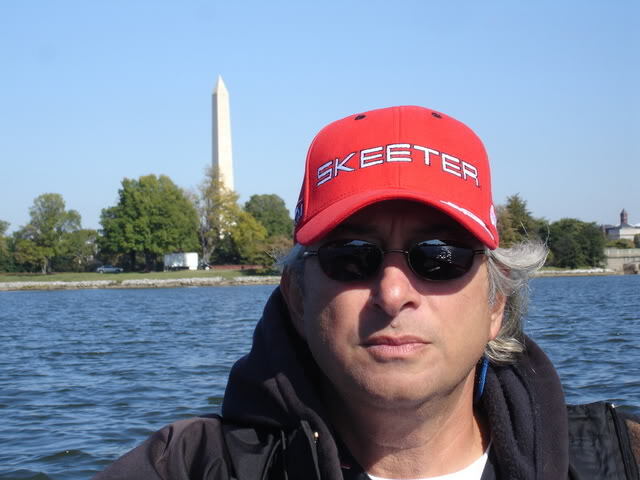 I will be back in DC in early April and I hope to look up Steve Chaconas. I will be interviewing several other people -- by way of research for my forthcoming book. I'd like to ask Steve a couple of questions. If you can share contact info I'd really appreciate it." The dialog deteriorated from there due to his entirely strange explanation for the CITGO witnesses and condescending tone so I never gave him Steve Chaconas' contact information, although it is openly published and he is quite easy to locate so Mark never really needed me for that anyway. 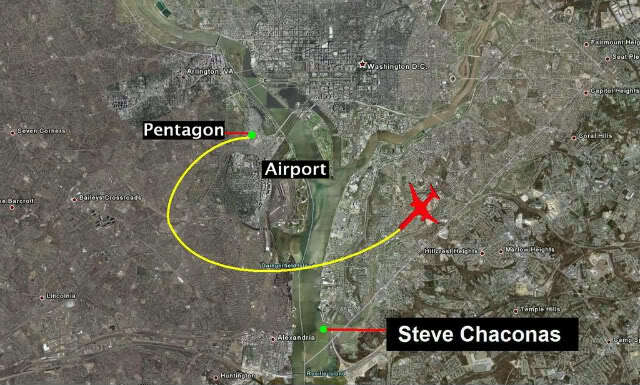 As it turns out though, despite this seemingly special interest in this obviously critical witness account that inexplicably has the attack jet as coming from east of the river or over DC skies, Mark completely failed to even mention Steve Chaconas in his book. Not even a passing remark in a footnote. Indeed, Mark failed to even entertain the possibility that the attack jet flew over DC at all and amazingly deferred completely to the 2007 released 84 RADES and the 2006 released NTSB data in this regard, even though he suggested that both of these government provided evidence sets are "dubious" or have been manipulated. What's clear is that Gaffney was already aware of Chaconas' account and had access to his complete interview that we filmed with him on his boat on the Potomac River in the exact spot he was when he saw the plane. And of course we know that Gaffney was fully aware of the mountain of evidence we reported supporting the DC approach of the attack jet as shown in our February 2008 released presentation that he admitted to watching. This is truly one of the most amazingly contradictory statements of the entire book and there are many. Besides the fact that Gaffney simply says there are "eyewitness reports" that definitively prove the NTSB reported location of the loop as opposed to one that may have been similar but scooted over a bit east to take it over DC , he doesn't cite any. This is because there aren't any. 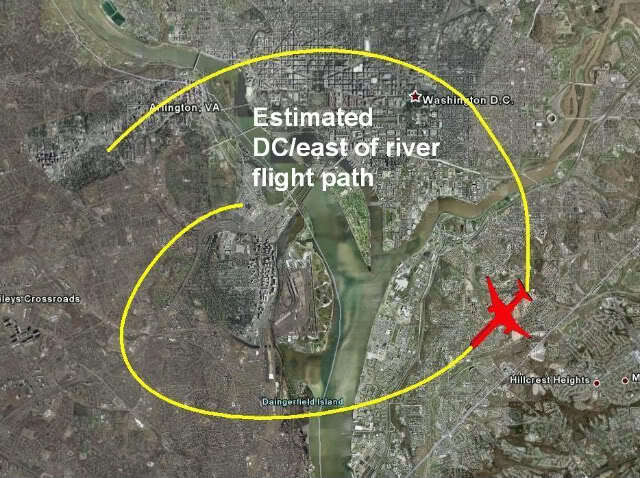 While a witness who was on the river like Steve Chaconas is in the perfect position to tell if the plane came from east of the river or not, if the plane never did cross the river as first stated by the NTSB in 2006, it would be virtually impossible for people in Arlington to judge the exact location of the entire loop that would not be accurately distinguishable to a naked eye on the ground. So Gaffney is relying solely on the government data, that he believes is fraudulent, as evidence enough to flatly and confidently deny a large body of corroborating independent evidence that the attack jet was east of the river. He instead uses this same evidence to suggest that it was the E4B, effectively merging the stories as we predicted, only to back off the claim weeks after the book was released. Notice how Gaffney does not preface this reckless claim with a qualifier like "possibly" or "potentially" even though there is nothing whatsoever that directly links this report to an E4B. This blatant assumption regarding this critical report is repeated throughout the book. 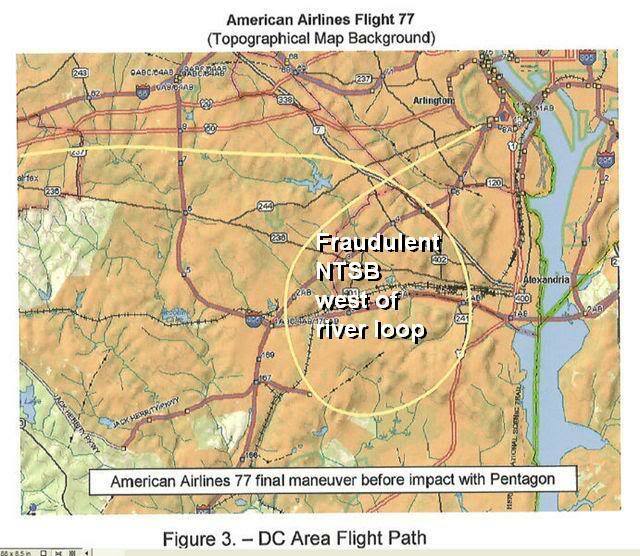 Gaffney's contradictory statements continued as he exposed the fallacy of his own assertion that the west of river loop depicted by the NTSB is "uncontroversial" by flatly admitting that the DC/east of the river flight path is in fact the common belief held by most since the attack, even to this day. He explains how it is also supported in an article quoting White House spokesman Ari Fleischer published only days after the event just as we discussed in our February 2008 presentation that Mark told us he had watched. Gaffney elaborated, "Scoggins is not alone in this (believing the attack jet flew over DC). 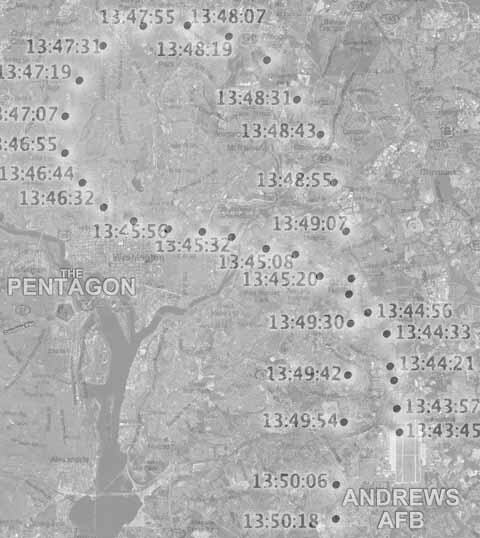 Even today, many Americans probably believe that Flight 77 made a loop over Washington before striking the Pentagon. White House spokesman Ari Fleischer actually gave rise to one of these stories, which were widely reported in the media." Why would Gaffney behave so illogically by choosing to accept the government data concerning the flight path of "Flight 77" while admitting that the same data sets were dubious or altered in other respects? What would compel him to confidently dismiss the notion that the attack jet flew over DC while admitting this was the commonly held belief with evidence to back it up? Why would he cite air traffic controller Colin Scoggins, whom he had interviewed, from the NORAD tapes regarding a DC flight path yet dismiss his recorded statements on 9/11 based on data that Gaffney believes to be fraudulent? How could he be aware of the explosive and quite relevant critical witness account of Steve Chaconas showing how the attack jet came from east of the river yet refuse to so much as mention this account in his book? The answer is quite simple. Mark Gaffney wanted to tie this evidence to the E4B to support his "theory" that it was in the air before the attack demonstrating foreknowledge. A theory that he would quickly abandon with the release of his book. The obvious problem with this behavior will become perfectly clear very shortly when I demonstrate how the primary evidence Mark cites proving the E4B existed at all, the CNN video, is enough to clearly demonstrate how it was seen after and not before the attack. There is no possible way for Mark to be oblivious to this so there is no justification for his actions. The CNN video is key because this is what brought the story of the "mystery plane" over Washington to light. Again, Mark Gaffney works hard throughout his book to create the impression that the evidence for a plane over DC before the attack was tied to this mystery plane. Over a year ago, CIT quickly put together our October 12th 2007 released presentation, "Flight 77" The White Plane, only weeks after CNN's Anderson Cooper did his big September 2007 story on the E4B. We put out the piece as a means to address this important new mainstream media acknowledgment and to demonstrate how the deliberate merging of accounts between the E4B and the attack jet was in active motion. We exposed how blatant this was with the ambiguous wording they used when considering the exact time it was that the E4B was caught on their own footage, as well as how they covered up the original time stamp with graphics in another clip with Senior White House correspondent John King mentioning a white jet. We expected this from the mainstream media so it was no surprise from them. But I have to admit it is particularly troubling that Mark Gaffney personally promised me he would view this presentation, yet he would still end up serving the purpose of merging the stories of the E4B and the attack jet just as we said. There can be no question that the entire premise of his book would do exactly that by blending these two very different evidence sets. This unfortunate situation is only made more evident by the fact that since the release of the book he has already been forced to publicly retreat from any notion that the plane was in the skies before the attack. So since this is the very video used to initially identify the plane, and since it's 100% clear from this video alone that the plane was spotted minutes after somebody mentions an explosion at the Pentagon, why would there ever be a doubt that the evidence proving this plane exists clearly demonstrates it was in the skies after the attack? Why would there be a doubt that the evidence for a plane in the skies before the attack would have to be referring to another plane? The only reason a competent researcher would refuse to acknowledge this would be to deliberately merge the two stories. Mark Gaffney was doing exactly what we said the perpetrators were trying to do. The campaign to blend the stories of this not so mysterious mystery plane with the covert flight path of the attack jet was in full swing via mainstream media, and now from an alleged official story skeptic. CIT has been screaming from the roof-tops regarding the extreme amount of evidence we have uncovered for a deliberately planted 2nd plane cover story. We mostly reference this in regard to not so ambiguous media reports of a C-130 over the Pentagon at the time of the attack bolstered by alleged witness Keith Wheelhouse's proven false claim that this much slower military cargo propeller plane literally "shadowed" an American Airlines jet and veered away at the last moment while the commercial airliner plunged into the building. We expose the details complete with an exclusive on-camera interview with Keith Wheelhouse in our appropriately titled presentation, The 2nd Plane Cover Story. The complete body of evidence proves the C-130 wasn't in the airspace until about 3 minutes after the attack but obviously any claims that it veered away from the Pentagon during the explosion would serve as perfect cover for the north side flyover jet. We exposed the E4B as cover for the east of the river DC approach right off the bat but to make matters even more complex, Mark Gaffney used another researcher by proxy, who goes by the name of John Farmer and is credited as the author of the "Afterword" in Gaffney's book, to suggest that the E4B and not the C-130 may have been the "shadowing" north side flyover jet at the time of the attack! So call this the cover story for the cover story if you will. As a reminder we had released video presentations exposing this plan in advance. So it did not come as a surprise to us that one of our most fervent detractors, John Farmer, would follow through so blatantly with our prophecy as if nobody would notice. The history of our relationship with John Farmer dates back to only days after the February 2007 release of The PentaCon Smoking Gun Version when he appeared on the scene out of nowhere attacking key witness, CITGO station employee, Robert Turcios who saw the plane "pull up" after passing by the north side of the gas station. Farmer's introduction to us was his use of the government provided CITGO station security video (that was amazingly released only 10 days after we first announced Robert's north side account online) to cast doubt on Robert's independently verified and corroborated account. He defended the veracity of the CITGO security video as if it were to his death (even though he was aware that another researcher had already provided proof it had been manipulated) while contradicting himself by simultaneously admitting an established precedent concerning the manipulation of government evidence when considering the Pentagon security gate video and the 2006 NTSB released alleged black box data. John Farmer's approximately two-year forced association with the "truth movement" has apparently come to an end but it had been heavily focused on attacking the research of CIT, as well as us personally, while working as a conduit for government data, so his agenda prior to any association with Mark Gaffney was already well known. So we announced how the media and government used the C-130 and the E4B as cover for the flyover. We announced how John Farmer specifically was working to blend these accounts. We knew that Farmer was acting as a major contributor to Gaffney's upcoming book about the E4B. But after we announced the account of the first critical flyover witness Roosevelt Roberts Jr. in April 2008, all hell broke loose. Soon after, on May 24th, Farmer published his essay "You All Just Haven't Talked About It" that blatantly asserted a two plane cover story while still working to remain semi-ambiguous about it involving the E4B. The story behind this essay is quite amazing to say the least. In the previous weeks, as usual, John Farmer had been disseminating government provided information like a sieve. What caught our interest was the fact that he was obtaining and releasing eyewitness report transcripts that had been archived by the Center for Military History (CMH). The main problem is that the names had been redacted making these anonymous accounts. If Farmer were a true skeptic he would have announced them as unverified government provided transcripts that are subject to manipulation and should not be automatically accepted until confirmed with the witness direct. In fact he would have stated that his main goal was to attempt to confirm them before accepting them as valid. He did no such thing and in fact did the opposite. It was clear that Farmer had every intention to use these accounts to his advantage. In other words he wanted to use these anonymous and ambiguous interviews, that were conducted on a human interest rather than investigative level, to support a wild disinformation conspiracy theory that 2 planes approached the Pentagon on 9/11 while one hit the building and the other shadowed it and veered away during the explosion. Exactly as we had predicted. So Farmer released these transcripts and we instantly recognized them as a potential gold mine. Particularly since many of the witnesses cited said they were located at Arlington National Cemetery (ANC) and already seemed to be placing the plane north of the CITGO. We immediately went to work using clues from the interviews to locate them at Arlington Cemetery. Our search was wildly successful as we quickly got a hold of one of the key witnesses, Darrell Stafford, (who is the Internment Foreman) and he introduced us to the other most relevant witnesses leading to the coup of the decade as far as 9/11 research goes. All of the ANC witnesses unanimously corroborated the north side approach of the attack jet as reported by the CITGO witnesses but just as important, they described the significant bank angle necessary for the plane to make it over near the west facade of the building. This was an incredible development since the interviews we conducted with them on-camera on-location ended up demonstrating beyond a reasonable doubt that there is no possible way the CITGO witnesses were mistaken regarding the north side approach of the attack jet. But more relevant to this article, they all also saw the "2nd plane". It turns out there can be no denying that the 2nd plane they saw was the C-130. They described it as having "propeller" engines and witness Darius Prather went so far as to describe the "USAF" for United States Air Force painted on the wing. But what's also notable and quite groundbreaking is the timing and approach direction they described. None of them described it as "shadowing" the attack jet and the consensus was that it didn't reach the airspace near the Pentagon until a few minutes after the attack. Even more importantly, they all described it as approaching from a different direction than the attack jet. They all said it came from the northwest over the cemetery which fatally contradicts the flight path of the C-130 as depicted in the 2007 released 84 RADES data. While this incredible revelation should have sent shock waves through the research community as significant evidence demonstrating a deception and cover-up, John Farmer has instead gone so far as to assert the fact that they contradict the official data as proof that they are not credible witnesses! The logic is truly astounding. As if a witness can only be credible if they corroborate the official story. For someone to dismiss independent verifiable evidence contradicting the official story based on nothing but government data, that even they have claimed was manipulated, is obviously the most ridiculously contradictory circular logic imaginable. Especially when the person has worked to position himself as an official story skeptic as Farmer has until days ago when he dramatically "quit" the truth movement. But there was one Arlington Cemetery witness in-particular who Farmer had focused on for his essay, quoted for the title, "You All Just Haven't Talked About It", and would end up using as the primary focus of the "Afterword" published in Gaffney's book. His name is Russell Roy. 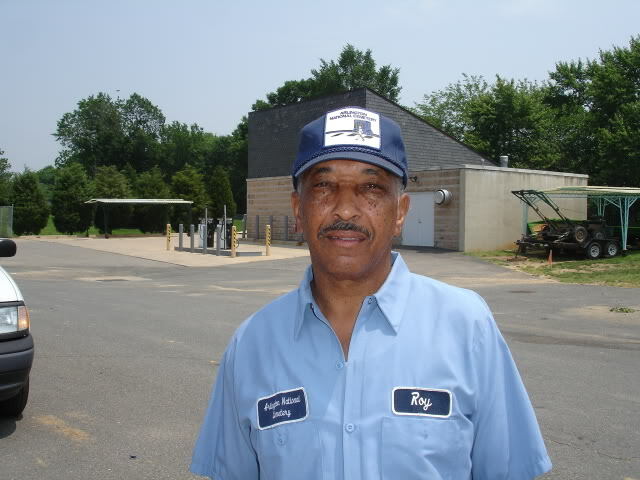 Russell is an auto-mechanic at the cemetery who did not see the attack jet at all. He was turning in his uniform to be laundered when he heard the big explosion. Shortly after he saw the C-130 approach from the northwest like all the other witnesses. His interview with the Center for Military History was more ambiguous in this regard and he seemed to describe this 2nd plane as being much lower than it really was and the directions he was describing were unclear. Farmer had suggested in his essay that this witness, who at the time was only known as CMH interview NEIT #428, was likely describing some sort of north side flyover jet, although he was initially careful not to specify that he was asserting this may have been an E4B. The time-line regarding the release of this information is very important because it reveals that John Farmer deliberately sent a proven false notion to go to print in Gaffney's book. The CMH transcript NEIT 428 was released by Farmer around the same time he published his essay on May 24th 2008 that tied this new but as-of-yet still unconfirmed and anonymous account to a north side flyover of some sort of 2nd plane. We had already made contact with ANC witness Darrell Stafford, whose transcript was released a few weeks prior, but this was not yet publicly known. We proceeded to interview the ANC witnesses including Russell Roy, #428, on June 6th, a mere 2 weeks later. Russell Roy would make it perfectly clear that the plane he saw never flew over the Pentagon at all and it is quite obvious that he was describing the C-130 coming from a northerly direction contradicting the official data and corroborating all the other ANC employees. Upon returning home we started compiling this wealth of new information in our presentation, The North Side Flyover. The trailer showing clips of the interviews was released on July 6th and publicly acknowledged and posted by Farmer in his now defunct blog. The full presentation with all of their interviews was released on July 31st. We received an email from John Farmer on August 2nd with the subject heading "Good work guys". He said, "Okay, so I have serious issues with some of your work, but you have done a great job with the CMH interviews. Now donï¿½t claim Iï¿½m endorsing your conclusions, but in gathering these interviews you are providing an essential service to all researchers." So it was clear he was aware of their names, what they said, and the fact that his essay that tried desperately to use witness Russell Roy, NEIT 428, as evidence for a 2nd plane north side E4B flyover had been proven incorrect. If Farmer was an honest researcher he would have made it his first priority to proactively inform Mark Gaffney of this explosive new evidence relevant to the Afterword Farmer wrote for his book, and told him he would submit a re-write as soon as possible. So we have proof that Farmer was perfectly aware of "more definitive evidence" regarding the direction the 2nd plane the ANC witnesses saw left the area. We have proof he already knew how absolutely none of them claimed the plane continued "towards the Washington DC area". We have proof he already knew the witnesses' names yet shamelessly play-acted as if they were still unknown. We have proof he absolutely knew that all of them had the 2nd plane turning back around before it even reached the Pentagon. We have proof he knew how none of them described it "shadowing" the attack jet, placed it approaching from a different direction all together, and that they only had it in the airspace minutes after the attack, not during. We have proof he knew how all of them perfectly described the C-130 complete with colors, propeller engines, straight wings, and Air Force markings, and that they obviously did not describe a very distinctive and quite massive E4B jumbo jet as photographed by Linda Brookhart over DC. In other words John Farmer lied about the evidence and used Mark Gaffney to publish those lies. While we don't have any proof that Gaffney was aware of the explosive new evidence we released 3 weeks before his book went to print, it seems odd that he would fail to pay attention to what Farmer had posted on his blog addressing the trailer we had released, and of course it is unconscionable that Farmer would fail to even mention it to Mark. Deliberately lying about this information as cover for the flyover is bad enough on Farmer's part, but this also served the dual purpose of covering up the fact that these witnesses revealed a breakthrough tidbit of information concerning the true approach direction and timing of the C-130, which also fatally contradicts the 84 RADES data, ironically lending credence to one of the main premises of Gaffney's book but for a much different reason than Gaffney would suggest. 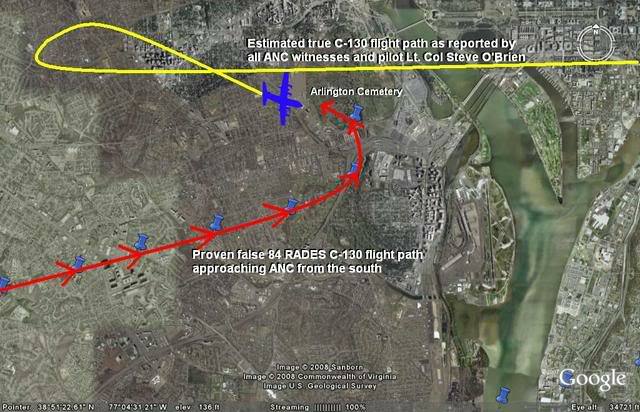 The big difference being the evidence the ANC witnesses provide demonstrating the C-130 flight path having been altered in the data is independently corroborated and perfectly valid, whereas it has already been admitted by Gaffney that he was wrong concerning the alleged evidence that the E4B flight path was altered out of the data. I had emailed Mark to request a free copy of his book in return for the free DVD he had requested from us and he obliged. It came in the mail shortly after the release in the beginning of October. Naturally I was amazed at the extreme levels of ignorance and deception displayed so I decided to confront Mark via email as civilly as possible. I simply asked Mark if he was aware of the July 31st release of the interviews we conducted with the ANC employees including #428 as referenced by Farmer in his book. Not surprisingly he denied any knowledge of the interviews. If Gaffney was telling the truth about this it means that Farmer withheld the information so he could proceed with his plans to insert this now proven false 2 plane north side flyover E4B disinformation theory in Gaffney's book. I pointed Mark to the new evidence and requested that he review it and release an addendum addressing the fact that Farmer's "Afterword" was deliberately based on a proven false notion. Mark refused to take responsibility for the false information in his book and instead, as expected, pushed this burden off on Farmer by replying, "If you don't like Farmer's Afterword, take it up with him. It's his research. He wrote it." This is particularly ironic given the fact that in the beginning of Gaffney's book, under the "Acknowledgments" where he thanks contributors, he very clearly states, "I am solely responsible for any errors that mar this book." Perhaps he really only meant accidental "errors" as it's now apparent that Mark Gaffney has decided he is not responsible for deliberately planted disinformation marring his book. Copyright 2007 Citizen Investigation Team. All rights reserved.